Two years ago, we replaced Airship’s house batteries with new lithium iron phosphate batteries. And, for those who just want the punchlines, we have two: 1) The performance of our lithium batteries has been fantastic through two full seasons of cruising and over 400 nights living aboard (with a high percentage of those disconnected from shore power). 2) No, we are not worried about our lithium batteries exploding or catching fire. Every year, we head north up the Inside Passage from the San Juan Islands to Southeast Alaska. During this time, we spend around a month cruising 4+ hours per day. Later in the season, we reverse the process and spend another month coming south. During those trips, our upgrade to lithium has meant we can go basically the entire route up and back (two months of our summer trip) without having to drag out the shore power cables and without running the generator. We leave the inverter on 24/7, and we have all the power we need – 12V DC and 120V AC – without having to worry about “power” at all. Half of Airship’s lithium array with the cover off. We didn’t have much room for batteries! The combination of lithium batteries, a good inverter/charger, and solar allows us to use power as we would on land, without having to check gauges, flip switches, balance loads, hook up shore power cables, or operate a generator. It’s made electrical power on the boat a complete non issue. If we’re staying longer than one night at a marina, we’ll hook up to shore power for our stay. If we’re at anchor for more than one night, we’ll run the generator for a couple hours each day. But for the majority of the time where we are cruising and spending a single night at each location, we simply have all the power we want. Let’s get this out of the way first, lithium batteries are expensive. But, boats are expensive. For us, when we factor in the advantages of lithium as house batteries, it has been well worth the investment. On the other side of the coin, Sam Landsman on Safe Harbour has a large array of flooded lead acid house batteries, and Sam makes compelling arguments for why he feels they are the better choice for him on his boat. We’ll circle back and do a more proper “total cost of ownership” analysis after we talk about capacity and performance. Almost all boats today use some version of lead acid batteries – flooded, AGM, gel, etc. Airship is a 2013 Nordic Tug 34’ which originally had 2 Lifeline GPL-4CT 6V 220 Ah lead-acid AGM house batteries wired in series to give 12 Volts and a total energy capacity of 220 amp hours (Ah). This was a woefully inadequate setup for our type of extended cruising. Lead acid batteries (including AGMs) should be maintained above 50% state of charge (SoC) to avoid damage, so 220 Ah “total capacity” yields only 110 Ah “usable capacity” – if the batteries start off at 100% and we use them down to 50%. But, lead acid batteries can be bulk-charged only up to about 85% SoC. That causes a problem when you are on the hook and depending on a generator to recharge. Your generator/charger can make fast work of re-charging up to 85% SoC, but after that you are running your generator for extended periods of time under low loads while the batteries sloooooowwwwwly go through “absorption” and “float” stages of charging to squeak in that last 15%. That means your more practical “really usable” range (without mistreating your generator) is only between 50% and 85% SoC, or 35% of the total capacity of AGMs (or any lead-acid battery). From the factory, that meant Airship had a paltry 77 Ah of what we’ll call “really usable” battery capacity at anchor. FLIR image of Airship’s Inverter/Charger at high load. Infrared images like this are great for spotting bad connections or any electrical components that might overheat and cause trouble. 77 Ah won’t get us far. We have a 12V refrigerator and an additional 12V freezer on Airship. Those, plus the other random loads that seem to be always connected are drawing between 10-20 amps most of the time when we are at anchor. If we are running our Wallas diesel heater overnight, throw in a few more amps. If you do the math on that, 77 Ah battery capacity will give you less than four hours with 20 amps of load. As a result, from the factory, Airship could barely make it overnight at anchor without over-discharging the house batteries. Even if we ran the generator long enough to bring the batteries slowly all the way to 100%, the 110Ah usable capacity gave us no more than about 10 hours with just minimal loads – lights, heater, refrigerators running. Throw in an inverter running some phone and laptop chargers and – well, you get the picture. And, this is with the setup on a “well-equipped” factory-new Nordic Tug. When we bought the boat, we doubled the AGM house batteries (even though there really was no space). We built an additional platform in the engine room that sat in the “aisle” in front of the existing house batteries and dropped in 2 more Lifeline AGMs. That gave us a total of 440Ah total capacity (which meant 220 Ah “usable” and 154 Ah “really usable”). It also gave us a very crowded engine room. This setup was marginally acceptable for extended cruising, but we had also added an inverter which made all sorts of other loads magically appear – dehumidifiers, espresso machines, laptop chargers, TVs, microwaves, WiFi gear – you name it. When you’re living aboard long term, you tend to lose the “camping” mentality and you want all the comforts of home because – the boat IS home. That meant we wanted more battery capacity, and there was no more space for batteries on Airship. We added solar, which gave us a great boost in effective capacity, but certainly wasn’t enough to meet all our needs – or our desire to not be constantly fiddling with fussy load balancing “no, don’t run the coffee machine while the microwave is on or if the electric water heater happens to be going…” And, along the Inside Passage it isn’t uncommon to have MANY cloudy days in a row. Solar is awesome, but we still needed more battery capacity as well. Airship’s solar charge monitor – we have two 260W Kyocera panels mounted on the roof, connected to separate BlueSky MPPT charge controllers. In the space where our four Lifeline AGMs were sitting, we could fit 600 Ah of lithium batteries. With lithium, depending on how they are rated, between 80-100% of the rated “total capacity” is also “usable capacity” without damaging the batteries. On ours, it appears to be close to that 100% number so far. So, in the same physical space where we had 154-220 Ah “usable” with AGMs, we now have 480-600 Ah “usable” with lithium. That’s basically triple the usable capacity in the same physical space. And, as a bonus, the Lithium batteries weigh only about ⅓ what the old AGM batteries did. As mentioned above, conventional lead acid batteries (like the AGMs we had before) can only be “bulk” charged up to about 85% of capacity. That last 15% has to be trickled in slowly during the “absorption” and “float” stages. When a charger says it’s “3 stage” that’s what it means – bulk, absorption, and float stages automatically delivered at the appropriate voltages. Lithium, on the other hand, can be charged at the maximum rate (which is VERY high) right up to 100%. If you’re running your generator to recharge house batteries, you can only go as fast as your charger (or in our case our inverter/charger). Our Magnum 2800W Inverter/Charger has a maximum output of 125A for battery charging. So, if our 600 Ah Lithium batteries are 50% discharged, we can replace that missing 300 Ah in 2 hours 24 minutes of generator run time, and that will be putting a decent load on the generator (around 15 amps AC) the whole time. If we were recharging lead acid batteries to replace that same 300 Ah, the first hour and forty minutes or so would be “bulk” charging at or near the 125A maximum, but then the charger would slow down to much lower “absorb” and then later much MUCH lower “float” charging rates. It would easily take 3 more hours, or a total of 4-5 hours to get that same 300Ah back into lead acid batteries. So, Not only would AGMs require double the generator run, but that last half of the generator runtime would be under a very light load, which is NOT good for diesel generators. Further (now that we have lithium batteries which can be charged at higher currents), if we wanted an even better system, we could have two inverter/charger units. That would give us twice the AC output capacity for driving house loads, and also twice the charging rate while running the generator. Our lithium batteries could easily handle double the charge rate (charge rates for most lithium batteries can be approximately the rated capacity in one hour) so even being conservative and never exceeding half that max rate, our 600 Ah batteries could take up to 300A charge. Two 125A inverter/chargers would give us 250A max charge rate, which would be no problem. Also, we’d have redundancy in case an inverter/charger ever failed. When we are underway, the engine alternator charges the house batteries. More capacity as well as faster charging here mean we almost always arrive at an anchorage with house batteries at 100%, and our full 480-600 Ah capacity available for the stay. Throw in 100-200 Ah extra that the solar might give us in a typical sunny day, and a couple nights at anchor without running the generator is a reasonable possibility. For single nights at anchor, we seldom to never have to run the generator. Or, if we’re at a marina for only one night, we don’t have to bother hooking up to (or paying for) shore power. One word of caution here is that having large batteries that can accept a high rate of charge can put a heavy workload on your engine alternator, so you need to be sure your alternator is up to the task. We have a VERY good 150A alternator on the engine, and we monitor the temperature of it underway when it’s at heavy loads. So far, it’s been flawless – temperatures stay cool (ish), no dust showing failing brushes, putting out the specified current, all good. Lithium batteries have a much flatter voltage curve than other battery chemistries. With lead acid batteries, as you take energy out of them the voltage slowly drops. With lithium, the voltage stays very near the “normal” (13.2V in our case) line all the way down to low state of charge. And, when you put a high current load on them, the voltage doesn’t drop significantly either. This means that lithium works better with large inverters, as putting a sudden big load from an appliance won’t sag the battery voltage and cause the inverter to shut off. The higher/flatter voltage is also good for the various DC motors – fans and so forth – that happen to be on most boats. FLIR thermal image of one of our lithium battery arrays with over 200A load. Lithium batteries have a lower “internal resistance” than other battery chemistries – about ⅓ that of lead acid batteries. That means less energy is lost as heat when the batteries are charged and discharged. If you’re using solar to charge, that lower internal resistance means that more of your captured solar energy becomes usable. It’s like having bigger solar panels. Lower internal resistance is also the reason lithium batteries can deliver higher currents, and can charge at higher rates. And, it means they run cooler during heavy use or heavy charging. Lithium iron phosphate are the longest-lived battery chemistry. Typical lithium batteries available today are rated for 2000-4000 full discharge/charge cycles. 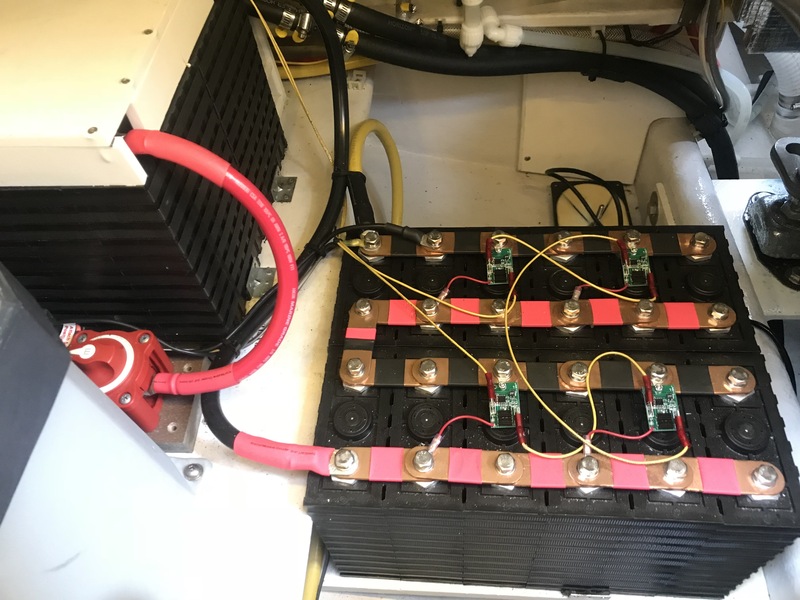 Under normal use, we don’t go anywhere near full discharge/charge, so it is reasonable to expect that lithium batteries would have a life of well over 10 years (and possibly 20) in a typical boat installation, making them a non-replacement item on your average cruising boat. AGM batteries (which are among the best lead acid formulations) typically have a cycle life of 500-1000 discharge/charge cycles, so Lithium batteries should have at least 4x the life of AGM lead acid batteries, and perhaps more. Given that you need 2x the total capacity with lead acid to get the same usable capacity as lithium, and the lithium lifespan is likely to be at least 4x that of lead acid, that would justify around an 8x price difference between lithium and lead acid for the same cost of ownership, same usable capacity, and same number of years. 2 Lifeline AGMs such as those that came with Airship will cost you about $600 discounted for a 110Ah “usable capacity” at 12V (220Ah total). A Victron 12.8V 160Ah lithium battery will set you back about $2,100, or about 3.5x the cost while giving about 15% more usable capacity. So based on our 8x “break even” number, lithium would appear to be less than half the cost over the life of the battery for the same capacity. A lot of things mitigate this cost advantage, however. If you’re not planning to own and use your boat for 20 years, you won’t see that 4x life span advantage. That probably brings the actual cost for a given capacity over the amount you’ll actually use batteries in a single boat to around parity. Still, the “lithium is way more expensive” issue is largely overcome by the advantages, even using just an economic analysis. Sam would chime in here and point out that you can get the same capacity of flooded cell lead acid batteries MUCH cheaper, and that (if you have the space) you can get at least the same capacity as lithium for the same number of years at a lower cost, as long as you maintain them and replace them every few years. You don’t get the other benefits – smaller form factor, lighter weight, higher current and charge rates, flatter voltage curves, more efficient charging – but the “big one” of more house battery capacity can be enjoyed at lower total cost of ownership. Let’s finish off with the one we hear most often “No lithium batteries for me – they explode/catch fire/etc.” This is not correct. There are several different formulations for lithium batteries. The kind we use for house batteries in boats are lithium iron phosphate (also called LFE or LiFePO4). These cells are not flammable. They will not explode or catch fire from “thermal runaway”. Other lithium formulations – such as Lithium-Cobalt-Oxide (LiCoO2 ) commonly used in laptops, cell phones, and other consumer electronics devices (and in some airliners) can store more energy in the same space, but are prone to “thermal runaway” and fires. This is where the “lithium explodes” story comes from, and it doesn’t apply to the LFE cells we use on boats. There is a type of battery used on boats that IS prone to explosion, however. Plain old lead acid batteries produce explosive hydrogen gas, particularly when overcharged. All it takes is one spark or one internal short and a flooded lead acid battery can explode violently. I unfortunately experienced this firsthand as a teenager when working on a car engine. I allowed a wrench to come in contact with the frame of the car and the positive terminal of the battery, and the battery exploded in my face. I was remarkably lucky, as I’m still here to tell the tale. Furthermore, for safety and to protect the expensive cells, lithium batteries are always used with a battery management system (BMS). The BMS cuts off charging sources if the batteries get near overvoltage/overcharged and cuts off loads if the batteries get near minimum voltage. This protects from damage due to over- or under-charging. The BMS also typically manages “balancing” the cells – which are nominally 3.3V each, but put four in series to make a boat-friendly 13.2V. Balancing makes sure that the cells all have the same voltage, as a “bad” cell could start to drop leading to overcharging of the remaining cells. Of course, we also have breakers and fuses installed to prevent overcurrent from causing wiring fires. We have had one situation where the boat was hauled out, taken indoors for maintenance (so the solar wasn’t working), and accidentally disconnected from shore power for several days. The refrigerator and other loads drew the lithium down to the minimum voltage, and the BMS cut the batteries off from the rest of the system as designed. We connected shore power, pressed the “reset” button, and everything quickly came back and was working again. The two full seasons, 422 nights aboard, and two round-trips up the Inside Passage with lithium house batteries on Airship have been an unqualified success. We’ve had solid, reliable service and enjoyed practically unlimited power with virtually none of the typical boating-related power management hassle. Lithium batteries are certainly still in the “early adopter” phase, and we don’t think they’re for everyone. But, the technology keeps improving, the cost keeps dropping, and the number of successful installations keeps growing. If that continues, lithium is likely to be the battery technology of the future for extended cruising.